Before I write about the Nokia Lumia 1020’s camera, I’d like to first look into the overall hardware. Though the camera makes up most of the phone, both figuratively and literally, the rest of the hardware needs to compliment that camera. There are several aspects of the Lumia 1020 that gives it a special feel and look. Let’s start with the color. Did you know that Nokia is well-known for the colors they use in their smartphones? Nokia has long made pretty and colorful phone bodies that are now iconic to its brand. Examples of such are yellow and red, flashy colors that will no doubt draw attention and awe from passersby, and white, for people like me who like the good looking phone body but rather remain inconspicuous. The colors of the Nokia Lumia series have been one of the largest selling points, with competitors like Apple attempting to jump on the bandwagon with their iPhone 5C. 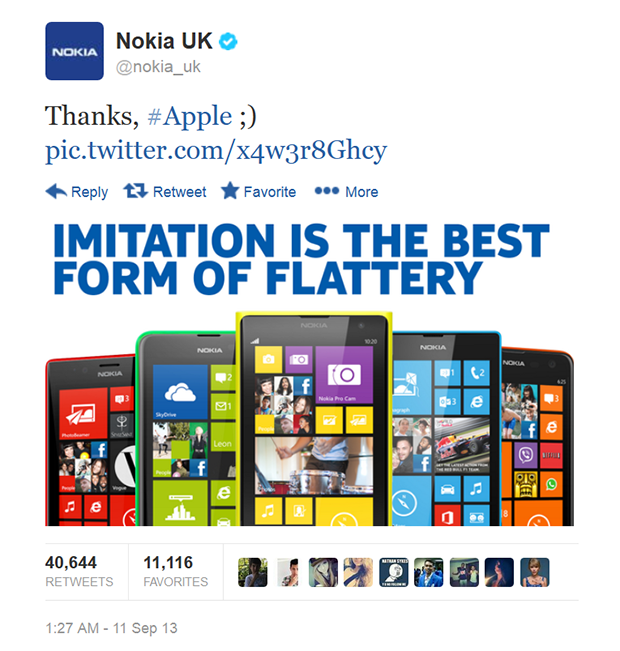 As a fun-fact, Nokia’s witty remark against Apple has, of this posting, racked up more than 40,000 retweets, making it the most retweeted brand tweet. The Nokia Lumia 1020 is available in three colors, white, black, and Nokia’s “hero color” yellow. It’s a pity it isn’t available in red, I know many who would love the Lumia 1020 in that color. A uni-body polycarbonate design, that is, a single inseparable piece of plastic, is used for the phone’s body. Don’t get put off by the term “plastic”, this isn’t regular plain old cheap plastic we’re talking about. Unlike many other brands that use polycarbonate in their phones, “color runs through the whole material” in Nokia’s polycarbonate material. This means that if somehow (you’d really have to go out of your way to do so) one manages to scratch a layer of the polycarbonate, the layer below is still the same color. Imagine if cars were like that! Unlike the Nokia Lumia 920, the Lumia 1020 uses a matte finish instead of a gloss finish. The difference is very noticeable, with the Lumia 1020 having an amazing feel to it. While the Lumia 920’s body may stain easily (albeit easy to wash), the Lumia 1020’s body has the addition of an anti-fingerprint and dirt resistant finish. Together with the durability that comes from Nokia’s polycarbonate and added resistances, one doesn’t require a case or cover for the phone like so many other smartphones. At the top right of the Lumia 1020’s front is the light sensor and the front-facing camera. The Nokia Lumia 1020 comes with Gorilla Glass 3, a step-up from previous Nokia Lumia WP8 flagships that used Gorilla Glass 2. This means that the already super scratch-resistant screen just got even stronger. While having a screen this scratch-resistant (note – not scratch-proof!) means a screen protector isn’t necessary, paranoid me usually puts one on anyway. For those like me, a screen protector with an awesome fit for the Lumia 1020 (see above) can be purchased at Adix82 here in Singapore. It should be noted that a friend of mine has been using the Lumia 1020 without a screen protector for over a month and hasn’t received a single scratch. Nokia Lumia screens, including the Lumia 1020, also come with Nokia’s PureMotion HD+ technology that provides the fastest, brightest pixels that promote visibility in bright sunlight and a sharp, crisp, and readable screen. Not sure what this all means? Have a look at Nokia’s promotional video on PureMotion technology above. Like the Lumia 925, the Lumia 1020 sports an AMOLED screen which requires less power than LCD screens and offers great contrast, though some might find images not as sharp and that colors may degrade over time. On the bottom of the device is a lanyard slot, microUSB port, and speakers. What’s interesting is that the Nokia Lumia 1020 is one of the only (and could very well be the only) smartphone in this day and age that has lanyard support built into the phone. This is great for accessorizing or for holding it like how you would a real camera, especially when housed in the camera grip. The speakers at the bottom are a welcome change from the Nokia Lumia 925, and similar to that of the Lumia 920. The speakers were obstructed by the wireless charging cover in the Lumia 925 which had them on the back, causing complaints that sound was muffled as a result. The top of the Lumia 1020 holds the MicroSIM card slot, a 3.5mm audio jack, and microphone. Finally, the right side of the phone has, from left to right of the above image, the physical camera button, the power button, and the volume controls. Windows Phone devices have always had a physical camera button, but this may be something new for those coming from an iOS or Android device (you’ll be surprised how many don’t know how to work with said button). The left side has no buttons and is nice and smooth. The physical buttons on the Lumia 1020 are made of aluminum and if I’m not wrong, have a matte finish as well. The buttons, when depressed, have a solid, firm depression that I kid you not, is one of a kind. It’s not a shallow depression like that of the Lumia 920 or Samsung S4 and have this satisfactory feel when pressed. One simply has to try it to understand my sentiments. Now, the highlight of the Lumia 1020: its camera. 41 MegaPixels of image capturing goodness, with Nokia’s PureView OIS (more on that next time) and lens by Zeiss. With great power comes great… Cost, unfortunately, as the camera does stick out slightly at the back of the device. It’s like a cute little Oreo. The camera portion is made out of aluminum, like the physical buttons, and has a black, matte finish. The camera itself has a shutter that actually opens and closes, very much like what you’d expect from a proper camera. Because of the bump, one must expect that the device will not be able to lie flat on its back. It may also be difficult to hold but its easy to get used to after a few hours or days. A powerful Xenon flash is present that’s great for low-light shooting, while a focus-assist light (which can be used as a flashlight) is also present. The back of the Lumia 1020 also features two small holes that click in with the wireless charging cover accessory. As compared to the other Windows Phone 8 flagships with 1GB of RAM, the Nokia Lumia 1020 sports 2GB of RAM. To be honest, I can’t feel a difference and must comment that more RAM isn’t something the Windows Phone platform requires right now, it’s already really smooth with just 512MB of RAM! Could Nokia be trying to play the numbers game with Samsung? The Nokia Lumia 1020 weighs 158g while the Lumia 920 weighs 185g. It’s great to see how Nokia is learning and managing to make their components and devices lighter, though I do miss the in-built wireless charging offered by the Lumia 920.